Airteq are a specialists in chip, dust and fume management equipment, As there are many different types of dust filter units available in the market place, making choosing the right system difficult. Airteq can guide you through the options, giving clear understandable advice about the types of filter available and which would be most suitable for your application. We provide solutions for small joinery shops, filters for welding rooms and systems to suit school and college classrooms. We can offer supply only of ducting or can carry out full site surveys and design of your system in any application whether it be ventilation, fume extraction or dust extraction and install your duct system should you require a full turnkey solution. In addition to dust and fume filtration equipment, Airteq can supply only ducting, flex and fabric filter bags to your requirements. To ensure you comply with current legislation we offer LEV, COSHH testing and air sampling. All our inspections and tests are fully in accordance with current Health and Safety Executive Control of Substances Hazardous to Health (COSHH) guidelines. Our engineers are competent in the examination and Testing of Local Exhaust Ventilation Systems. As part of our complete service to our customers and clients, in addition to performing LEV tests. At Airteq we understand welding fume extraction. We also understand there is no “one solution” to cover clients needs. With our combining knowledge in the Dust and Fume Extraction industry and experience in fabrication and welding processes we are able to bring to the UK our Airteq range of weld dust and fume extraction products. We invite consumers, to take advantage of our Welding Fume Extraction and Dust Extraction products which we believe provides the best combination of quality, durability and value for money available in the UK. Whether you need a single mobile extraction unit or a complete turnkey welding fume extraction system Airteq can provide the answer. High efficiency filter units designed to offer complete flexibility in the air capacity required and the waste collection method selected. 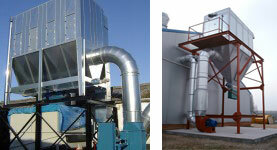 These systems allow all the machines from vaworkshops to be ducted to a single extraction unit. Comprising of one or two units which can be located next to individual machines and electronically interlocked with them to turn on and off automatically were required. 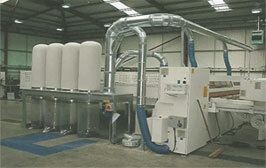 Airteq Ltd, manufacture our own 3 and 4 bag dust collectors at our fabrication Facility. Our Open Bag extraction units are designed as an inexpensive method of collecting sawdust and chipping combining air re-circulation within the workshop and simple quick release waste bag removal. Designed for fine dusts generated from sanding machines etc. These tables are ideal for use with hand tool operations that produce dust or fumes. Bespoke extraction hoods and manifolds are designed and manufactured by Airteq at our facility. We manufacture hoods to extract effectively from all source types. Machines such as polishers and grinders have their own capture hoods which can be connected on to one of our mobile separator units to provide effective extraction. Suitable for use with welding or general fumes. The arms can be self supporting flexible in all directions or mobile. We carry a range of fabric filters in a wide range of filter media that fit all leading makes of extraction unit. One-off’s can be made to replace obsolete brands. We install a range of both mechanical and electrical pressure gauges suitable for negative pressure systems.